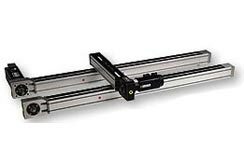 The RACO LM Linear module is the corner stone for both single axis or multi axis application. The carriage travels on easily adjustable roller bearings, and surrounded by a shock absorbing elastomer tires. The system is driven by a steel reinforced cable, and a zero backlash timing belt. The RACO LM series drive is engineered for high speed capability, and long travel also known as (stroke). 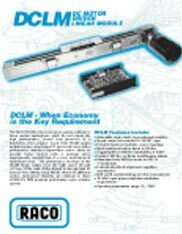 The LM series is designed for medium side load capabilities frequently used in modern motion control and automation applications. The RACO LT2060 Linear Drive is engineered to handle heavy loads at moderate speeds. The carriage is structurally supported by, and glides along via slides. 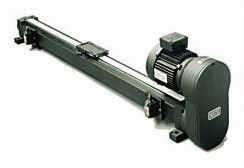 ACME, or Ball Screws drive the actuator belt thus allowing the drive to accommodate heavy duty applications. The drive performs in a manner that closely relates the RACO MA Rod Type Electric Actuators. 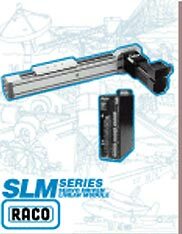 The RACO LM series drive however, has a much longer stroke length then the RACO MA Type actuators. 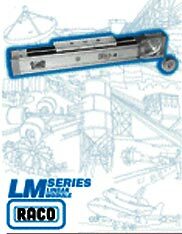 The LM series Linear Drives are available in 2 sizes. LT2060 series ACME or BALL Screw Driven, or Reinforced Steel Belt driven Linear Drives.